First up, Lincoln Park's Perennial Virant. While I'd dined at PV for my birthday dinner a few years ago, I'd never been for brunch. 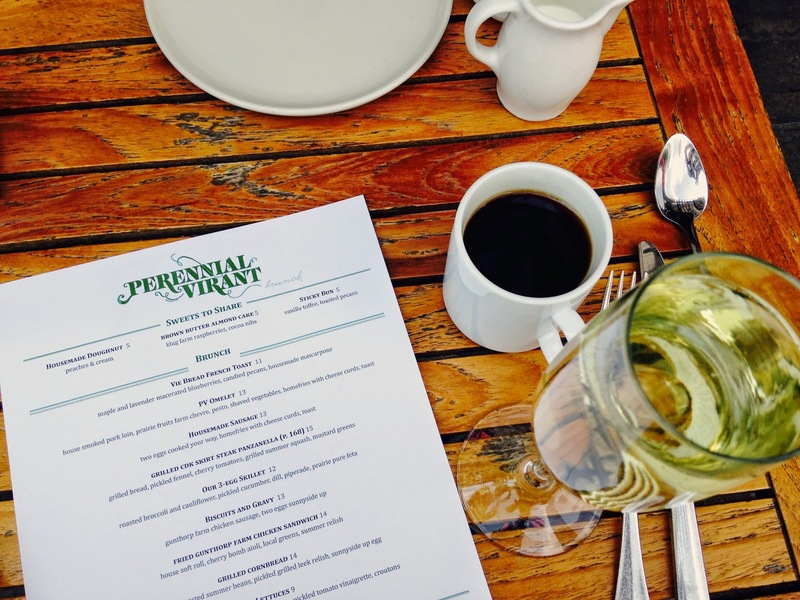 Perennial Virant's brunch menu is fairly small with about eight entree options, and three sweets options to share. 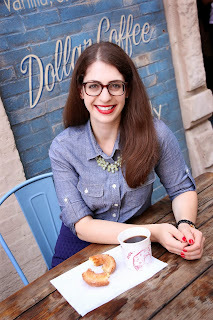 My friend Sarah and I started with the seasonal doughnut which was filled with peaches and cream. One would think by looking at it that it'd be heavy, but it was light and airy and not overly sweet. 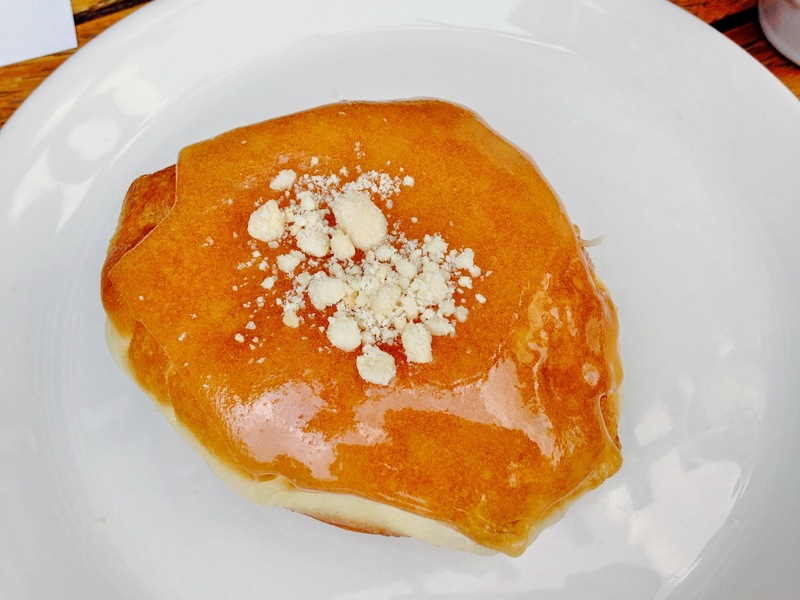 Doughnut fillings change seasonally--the current doughnut features dark and white chocolate, and peppermint! After trying something sweet, we both decided on savory options for our entree. 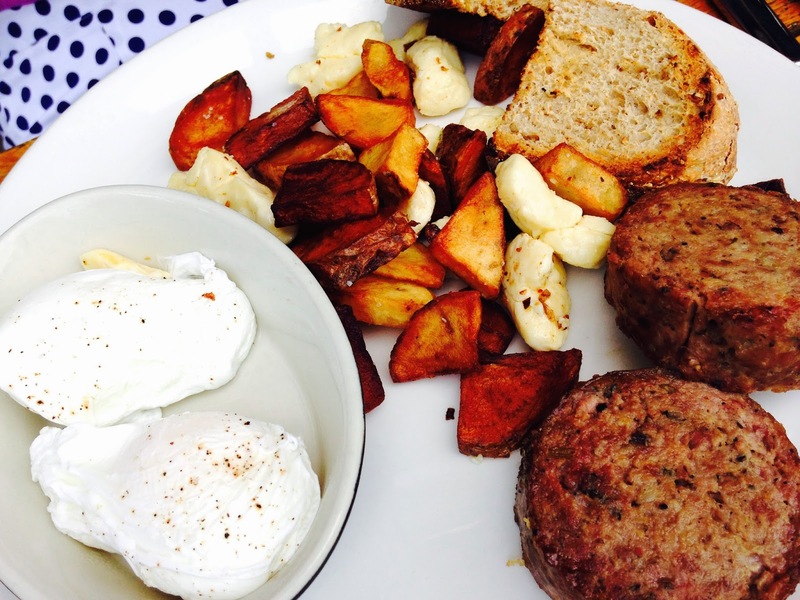 Sarah ordered the housemade sausage served with eggs, homefries and cheese curds, and toast. Yes, cheese curds! Why can't all homefries come with cheese curds? I ordered the PV omelet filled with pork loin, chevre, and pesto, and topped with beautiful market veggies including radishes and cucumbers. The omelet was also served with homefries and cheese curds, and toast. We both felt the freshness of ingredients really elevated both of our entrees. The breads and home fries were also awesome! This was a solid brunch choice with great service as well. I'm giving brunch at Perennial Virant 5 ghosts out of 5! My next brunch endeavor was also in Lakeview at Q-BBQ. As with Perennial Virant, I'd been to Q for dinner, but not brunch. Q-BBQ's Lakeview location began serving weekend brunch late last year. 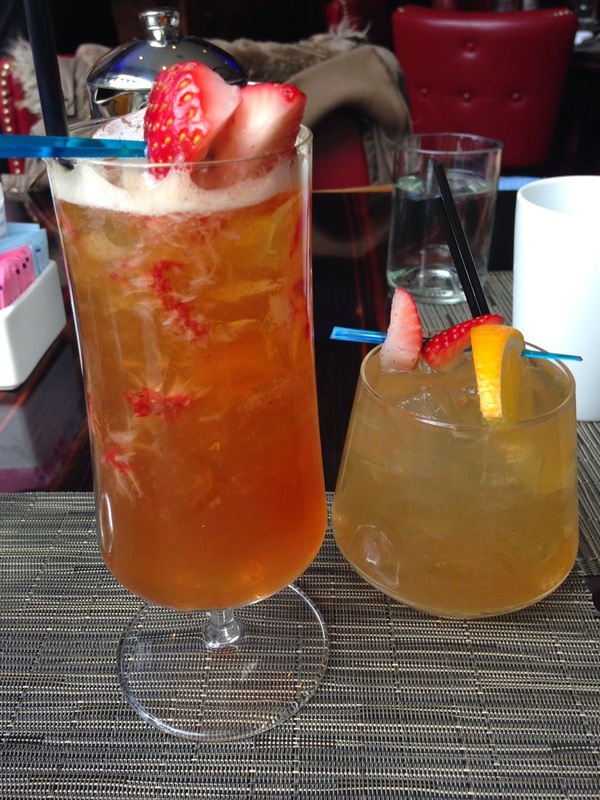 The menu is a barbecue twist on classic brunch options and they also offer a bloody Mary bar. My brunch partner-in-crime and BA (Brunch Authority), Sharon, joined me at Q-BBQ for Saturday brunch after a brutal workout down the street. We were hungry and found satisfaction in the burnt ends hash. Q is known for their burnt ends and I appreciated their creative inclusion in the hash. The hash included potatoes, red onion, fried Brussels sprouts, roasted corn and black beans, and two fried eggs. There was a ton of smoky flavor and I'm pretty positive this dish could cure any hangover. We also tried Q's take on chicken and waffles. I wasn't a huge fan of the chicken on top. They seemed like fast food chicken fingers and I'd much prefer a bone-in option, or chicken breasts. The waffles were also topped with mashed potatoes which I found pretty unnecessary for the dish. There was also a few strips of smoked bacon and smoked syrup on the side. The waffle was pretty lackluster and soggy...can you tell I didn't like this dish?? Lastly, we had the crowd favorite and showstopper, cornbread French toast. How can something so simple be so delicious? The BA and I both commented on how we hadn't seen this on brunch menus anywhere else in Chicago (have you?). It was sweet and savory at the same time and perfect with the smoked syrup. Bacon also made an appearance on this dish, but it didn't need to to stand out in our minds! Q-BBQ has some really great brunch options (burnt end hash and cornbread French toast), but stay away from the chicken and waffle. *Because this meal was complimentary, I will not give it an overall ghost rating. 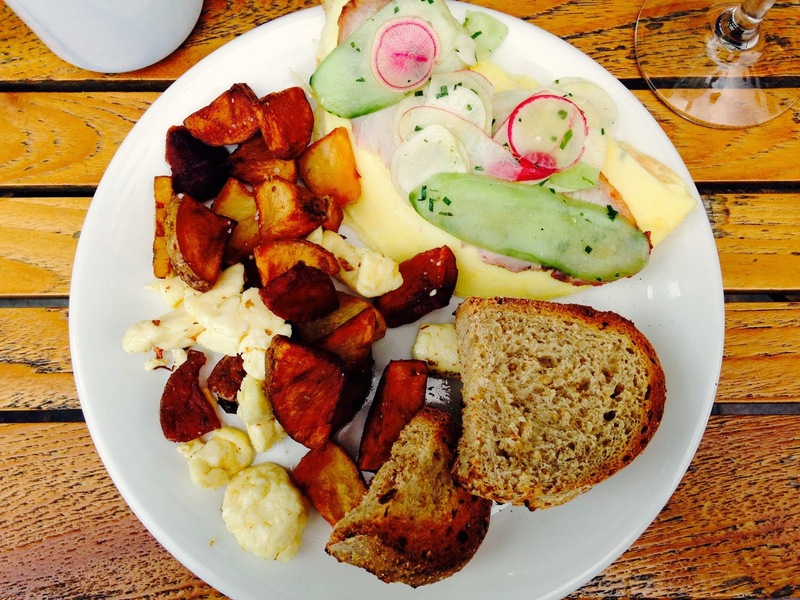 Next in my brunch round-up had me (and the BA) heading South to River North's Joe Fish. This Rosebud restaurant has an Italian seafood focus. 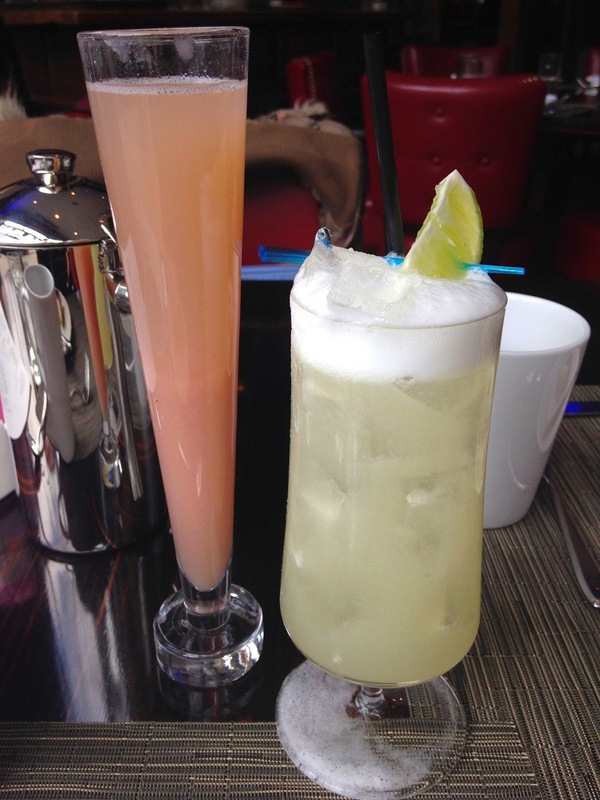 There are quite a few cocktails to choose from on the brunch menu and we tried four. Some were hits, including the Pimm's cup and Gin Fizz (which the BA ordered), while the boozy punch was a miss (the bellini was pretty good, though). The brunch menu features biscuits from Logan Square's Bang Bang Pie & Biscuits. I'm not sure how this partnership was formed and I don't care because it's frickin' delicious. You can order a biscuit with butter and seasonal jam, or dress up your buttery biscuit with cheese, a variety of proteins, including fried chicken or ham, or gravy. We stuck to the simple option, which was fantastic. For our brunch entrees, we decided to split one sweet and one savory option. The sweet option was the pecan sea salt caramel French toast (say that 10 times fast). I did not taste any caramel or pecan. What I did taste were random pockets of sea salt. Not exactly what I'd hoped for. Our savory entree was the Maine Lobster Scrambled Eggs. I ordered this strictly for the lobster and shaved truffles on top. You bet I was upset when the dish arrived sans truffles. Very odd and hopefully just a fluke. There was a decent amount of lobster but without those truffles, this was simply scrambled eggs with a croissant and a side of fruit. While I did enjoy the atmosphere at Joe Fish, brunch options were not up to par. With so many great brunch restaurants in this city, I'm afraid I won't be back. And lastly, brunch at Hash House a Go Go on the near North side. This chain serves brunch all day which is a major bonus. They're especially known for their massive portions, as well as their sage fried chicken & waffles. which we had to order. Sarah joined me for this brunch as well and we split the fried chicken & waffles, and the cinnamon roll pancakes which were on special. The waffles have strips of bacon INSIDE (pure genius) and form the base of the fried chicken tower. You get two huge pieces of fried chicken breasts and three waffles, as well as the fixin's: cherry tomatoes, sage, fried leeks, and a maple reduction. The chicken is perfectly crispy and juicy; however, the waffle did become soggy. That's probably inevitable with the weight and moisture of the chicken breasts. We both agreed this was some of the best chicken & waffles we'd ever had. The cinnamon roll pancake was a giant flat pancake rolled up to resemble a cinnamon roll, and sliced into thirds. The pancakes were super moist and came with a cinnamon sugar glaze that we used to dip our pancakes in. It was so tasty I had to refrain from finishing the entire plate. I'm giving Hash House a Go Go four ghosts for serving brunch all day, their great chicken & waffles, and massive portions (be sure to bring a big group! ).